In late April of 2014, our leadership team met with Mark Petersen, Executive Director of Bridgeway Foundation, at their downtown Toronto office. Over hours of conversation, we shared our concerns, thoughts and hopes about digital fundraising in Canada. On the plane ride home to British Columbia, we envisioned a plan that would motivate charities to become more innovative online. In the following months, our team secured a grant to study fundraising best practices, examining a 55 point checklist for each of 92 member organizations listed by the Canadian Council of Christian Charities. Months of research, micro-donations and writing later, we had a report in our hands. This report can be downloaded at digitalcharity.ca. To connect the study with tangible results, the capstone of the project was to lead six charities through a best-practice matching campaign. Each charity served the area of urban poverty relief, but were different sizes and in different cities. Bridgeway Foundation is a private family foundation that supports non-profit organizations through financial grants and partnerships. They stimulate innovation within the social sector and strengthen organizations’ capacities to serve. Working in tandem with their generosity, we devised a plan to organize and execute six pro-bono match campaigns for $10,000 each, for a total of $60,000 in matching funds. Eligible charities were encouraged to apply for Bridgeway’s grant by submitting an application that highlighted a project in need of funds. Once selected they were informed, and Bridgeway gave us notice of winners to begin our summer partnership. None of these six charities had sent out similar campaigns to their email list in at least the previous twelve months. We needed to keep things simple for two reasons: we were walking through major digital campaigns with strangers to whom we’d be introducing different tools, methods and tactics. We also wanted to make sure that there was consistency across the group to provide clearer analytics. 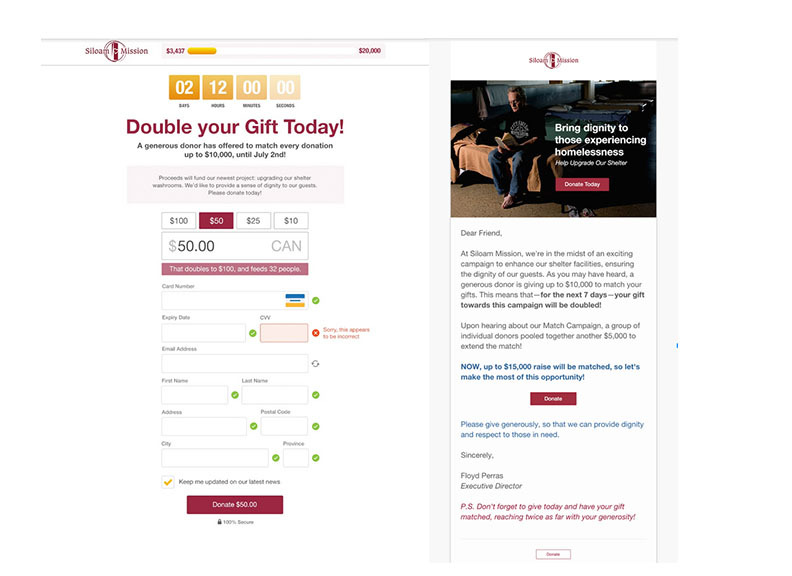 Using the best practices from our digitalcharity.ca report, build a simple landing page that can be adapted for each of the six charities. Work with each charity to set up a Stripe.com account for processing donations. Set up donor friendly confirmation pages & thank you emails. Create an eblast that can be adapted for 10 or 20 day campaigns. Send a kick off eblast on day one to their whole list. Send a last-day reminder on the final day to the whole list. Send a ‘few hours left’ eblast in the final evening to those who did not open the previous email. Send a Congratulations/Thank-you eblast to everyone the day after. *exact day for sending each eblast may vary 1-2 days depending on day of the week and whether the campaign was for 10 or 20 days. For most charities, we posted on Facebook or tweeted. Others successfully inspired major donors to put down money and thus drive their campaign further. Organizations that surpassed their goal early on were encouraged to approach major donors and request that their gift be used to motivate others to give more. In this way, the campaigns kept up their momentum until the end of the 10 or 20 day period. Having “in the moment” action made for exciting days! Over 300 hours of volunteer time from ten Frontier staff and dozens of hard-working development staff from six different missions worked to send 38 eblasts to over 44,000 subscribers. It made for an incredible summer. A grand total of $237,476 was raised. $177,476 came directly from online donors, and 15% came from offline gifts directly as a result of the campaign! Every charity reached the $10k match threshold, with the best performers raising $33.9k, $48.4k, and an astounding $58.2k. 1,270 donors contributed to the match online. 23% of online gifts came in the first day of the campaign while 35% came in the final day. We noticed a significant increase in e-commerce conversion rate (in other words, the percentage of people who come to the page who donate). During the campaigns (10-20 day periods) the charities averaged 12.36% conversion of site visitors as compared to 2.44% March through May (90 day periods that included an Easter and a Camp fundraising ask). The average gift increased 11%, or $14.44, over the March to May average. Of the three charities with data before and after our campaign, 56% of all online donations from June 21 till August 22 were attributed to the match campaign. The three big charities with complete data from previous months increased their mobile conversion rate by 867% during the 10 days of the match, when compared with March through May. 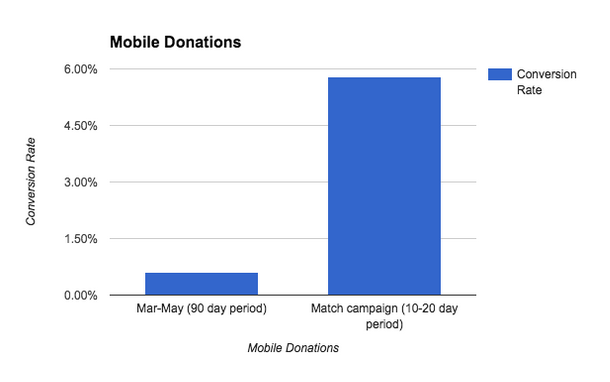 They had 128 combined mobile donations for a 0.6% conversion rate on those three months, in comparison to 116 mobile donations during the 10 day match for a 5.8% conversion rate. These three organizations raised $13,653 through mobile during the match campaigns as compared to $5,158 the three months of March through May. Tablet giving changed too. Tablet conversions went from 2.45% conversion March through May to 12.87% during the campaign. They raised $11,766 from tablets during the campaign, up from $5,456 March through May. Whereas mobile and tablet represented 13.9% of online giving in March through May, during the campaign they contributed to 20%, an increase of over 43%. Match campaigns can transform fundraising campaigns through the power of multiplication, extending the impact of each donor. But these campaigns are about so much more. The partnerships over this year contributed to hundreds of thousands of dollars raised, and many lives changed. The human impact happened when the excellence of collaboration met the innovation of technology.